Stress management is frequently a focus of patient intervention which can be improved upon by digging into the nuances of signs of stress and teaching patients that coping with stress can improve their outcomes regardless of their chief complaint. Some signs of stress are obvious, such as areas of tension that regularly occur after weekly meetings with an overbearing boss. Less obvious signs of stress may be blood pressure or blood glucose readings that defy improvement despite numerous medications or supplements, or gastrointestinal complaints without corresponding pathology or lab diagnoses. While these nuanced signs are often easier for an objective third party to recognize, helping the patient to realize the role of stress in seemingly unrelated health concerns may require a different strategy. A common complaint of someone needing specific attention to stress management is never feeling rested despite adequate sleep time or feeling excessive fatigue after exercising. For the patient who does not think stress affects them or do not recognize the signs of stress, asking focused questions such as how their energy levels fluctuate throughout the day, difficulties falling or staying asleep, or how they feel after eating a meal can be valuable clues. Complementary to a patient’s history are lab tests that evaluate key hormones and neurotransmitters such as cortisol, DHEA, and epinephrine/norepinephrine. 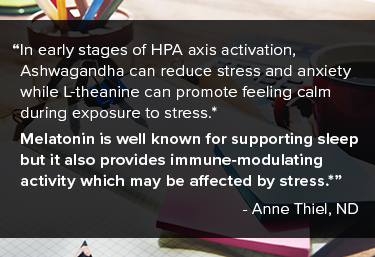 Cortisol can provide helpful guidance in developing a plan and potential stage of HPA axis dysfunction, although normal results do not negate complaints of stress or fatigue. A full thyroid panel is also necessary as adrenal and thyroid function are intimately connected. Lab work before and after working through a plan of action is a great way to provide patients with tangible information regarding efficacy of interventions or supporting the need to adjust the plan. Most patients know they should be getting a good night's sleep, eating less sugar and more vegetables, and managing their stress with yoga or meditation instead of a pint of ice cream while watching TV. How to manage stress in a manner that restores health and maintains that motivation for healthy habits is the art of medicine. A simple skill for stress management is to bring awareness to the heart rate through deep breathing. Patients can find their pulse and feel the change that a long exhale brings; this can be done almost anywhere, at any time. We often ask patients to do more than just take a pill, so providing them with an organized reference sheet can improve their understanding of our recommendations, leading to improved compliance and outcomes. Asking them to fill out a form allows them to play an important role in their care, instead of a practitioner just telling them what to do. Organizing their care in a form that is easily read and referenced allows patients to spend more energy on taking care of themselves instead of deciphering a treatment plan. This also creates the space to develop a dialogue with patients about their care and for them to take responsibility for their progress, or lack of, in a non-judgmental style. For example, ask patients to provide an example of a personal mark of progress or goal, such as having enough energy to join a sports team or not relying on a cup of coffee to make it through the afternoon. This provides more descriptive information than simply rating stress or exhaustion on a scale of 1-10. Supporting sleep and metabolic processes is necessary for all phases of stress management; different supplements offer different benefits for the various phases of coping with occasional stress. * Understanding where your patient falls on the continuum of HPA axis function provides a guide for recommendations. Lab values only tell part of the story, listening to the verbal and non-verbal clues your patient provides is invaluable. By paying attention to the nuances of the signs of stress and integrating multiple stress management techniques, your patients will succeed at coping with occasional stress. We cannot avoid or control all sources of stress, but we can always improve how we manage it. Pratte MA, Nanavati KB, Young V, Morley CP. J Altern Complement Med. 2014;20(12):901-8. doi:10.1089/acm.2014.0177. 2 White DJ, de Klerk S, Woods W, Gondalia S, Noonan C, Scholey AB. Nutrients. 2016;8(1):53. doi:10.3390/nu8010053. 3 Kennedy DO. Nutrients. 2016;8(2):68. doi:10.3390/nu8020068. 4 Carrillo-Vico A, Lardone PJ, Álvarez-Sánchez N, Rodríguez-Rodríguez A, Guerrero JM.. Int J Mol Sci. 2013;14(4):8638-8683. doi:10.3390/ijms14048638.